Introduction – In last article we discussed about the first cave temple of Tamilnadu excavated by Pallava king, Mahendravarman I. In this article we will talk about another cave temple, which was excavated by the same Pallava king, however this cave temple shows many signs of advancements in the architecture and design during the time of that king. recessed backward for allowance of steps to be carved out of the same rock. The front façade is supported in two pillars and two pilasters. These two pilasters can be treated similar to the pillars, as in case of Manadagapattu, only difference is that these form a niche to house dvarpalas. These pilasters do not show any saduram and kattu pattern, as they are square from bottom to top, different from pillar like pilasters of Mandagapattu. On the two corners, inside the niches, are two dvarpalas. It seems that these niches were not in original plan, as evident from shortened roof moldings as it does no reach to cover these two niches. The front pillars are similar as that of Mandagapattu, only difference is that we find lotus medallions on each face of top and bottom. This is an advancement from earlier design. The two pillars and two pilasters arrangement makes up three bays with three openings into the cave. Another advancement is seen in form of an exquisite makara-torana. From the mouth of two makaras, ridden by a gana each, comes out huge foliage which merges with the foliage coming out of two smaller makaras in the middle. Hence this forms a double bend makara ornament. In the middle, between the two proboscis of makaras sits a gana. As per Dubreuil, this style is taken as characteristic feature of Mahendravarman’s time. Just above the middle of the torana is a kudu formed by two foliage issuing out from makaras at the base and meeting at the apex point of the kudu. There are total of five kudus, however their arrangement is slightly awkward. The central kudu is placed correctly, just in the middle of two middle pillars. Any of the other kudu does not appear either above the pillar or in between two pillars/pilasters. The mandapa inside the cave is 21.25 feet in length and 16.5 feet wide. In this mandapa is found another shrine, which is carved on the west wall of the cave so that the shrine can face east. This shrine chamber is 7 feet 10 inches long and 8.5 feet wide with the height of 6 feet 10 inches. This is the only cave of Mahendra where such a shrine is carved out, otherwise all other caves have niches on the back wall. The idea of a shrine facing east is surely an advancement in design. 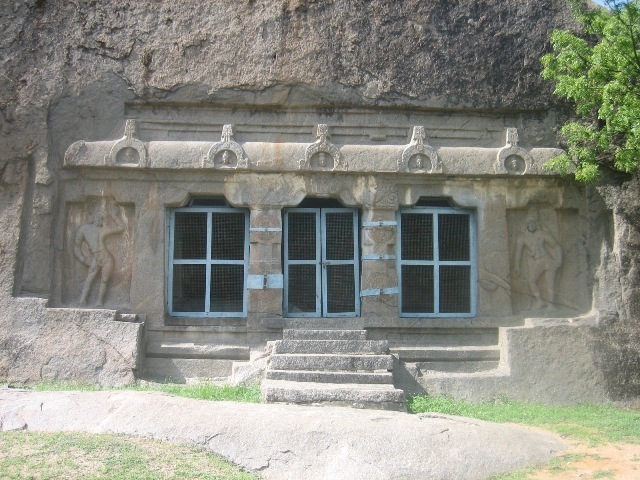 The similar design we see in Mahishasurmardini Cave at Mahabalipuram. The shrine, here, is attached to a ardha-mandapa kind arrangement which is supported on two pillars. The pillars are with square bottom with octagonal shaft. Inside the shrine is a Shivalinga, which is fixed into the hole meant for it. There are two dvarpalas on each side of the main shrine. Dvarpalas – There are two sets of dvarpalas, first set is carved on the front façade and another set is on entrance of the inside shrine. External Façade Dvarpalas – On the front façade we have two crudely carved dvarpalas. Dvarpala on western end is shown in tribhanga posture. He is wearing a long makuta with huge jata-bhara behind his head. He is also wearing a yajnopavita, necklace, bracelets, bahu-valayas etc. His one hand is on his waist and another hand is raised in adoration. He is wearing a layered makuta, as three such layers are visible. Though it is a layered makuta however it does not fall in the category of karanda-makuta. Interestingly, this dvarpala does not have any weapon with him. Eastern end dvarpala is also shown in tribhanga pose, however he is resting on the support of his club. His club handle is stuck in his right arm-pit. This kind of support over the club is similar as seen at Mandagapattu. He is shown wearing yajnopavita, necklace, bracelets, valayas, kati-bandha (waist girdle) etc. His one hand is on his waist and another hand is stretched along the side of the club. He is not wearing a layered makuta, but a regular long crown with jata-bhara behind the head. On top portion of his crown is seen a symbol of trisula (trident), however I am not very sure of this. If this true then this cave would have been dedicated to Shiva. Inner Shrine Dvarapalas – This set of dvarpalas are carved much finer in comparison of the previous set. These are smaller in size as compared to the previous set. Both the dvarpalas are shown with same posture, standing in tribhanga pose with one hand on their waist and another raised in adoration. Both shown wearing necklace, bracelets, yajnopavita, valayas etc. They are wearing long makuta with jata-bhara behind the head. The crown of the southern dvarpala is carved in much more details, in fact he is in total much completely carved in comparison to its counterpart. 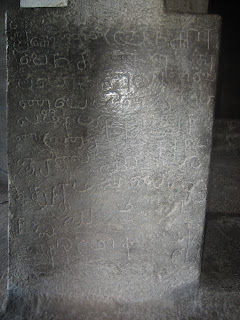 Inscriptions of Dalavanur – There are three inscriptions, one in Sanskrit, another in Tamil copying the Sanskrit one and third is also in Tamil but added in much later compared to previous two inscriptions. Translation – Narendra Satrumalla, who has humbled kings by (his) army, caused to be made on this hill this (temple named) Satrumalleshvaralaya.Satrumalla as a title of Mahendravarman I is also found at Trichy and Vallam cave temples. Translation – Properity! The king (who wore) a beautiful garland of tondai, Narendra-Pottaraiyan, whose cruel bow bristled with arrows, made with great joy in the south of Venbettu (this temple) named Satrumallesvaralaya, to be the residence of Hara (Shiva). 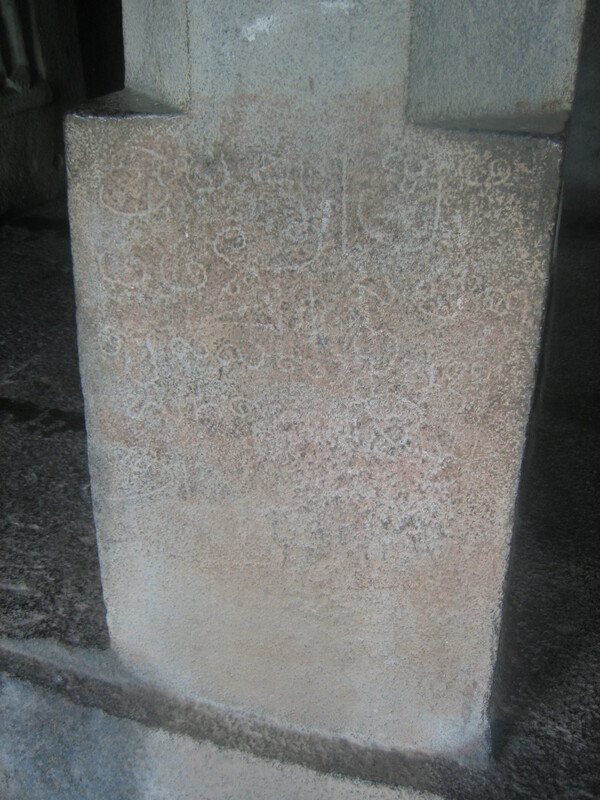 Translation – Brahmamangalavan Sellan Sivadasa of this village composed this. 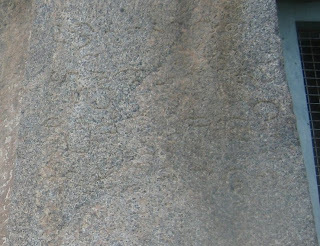 K R Srinivasan puts forwards few interesting points related to Sanskrit and its duplicated Tamil inscription. He states that it is very uncommon that a foundation inscription is copied after two centuries of the construction of a shrine, as it is seen here that Sanskrit inscription is assigned to seventh century and Tamil inscription is assigned to 9th century. 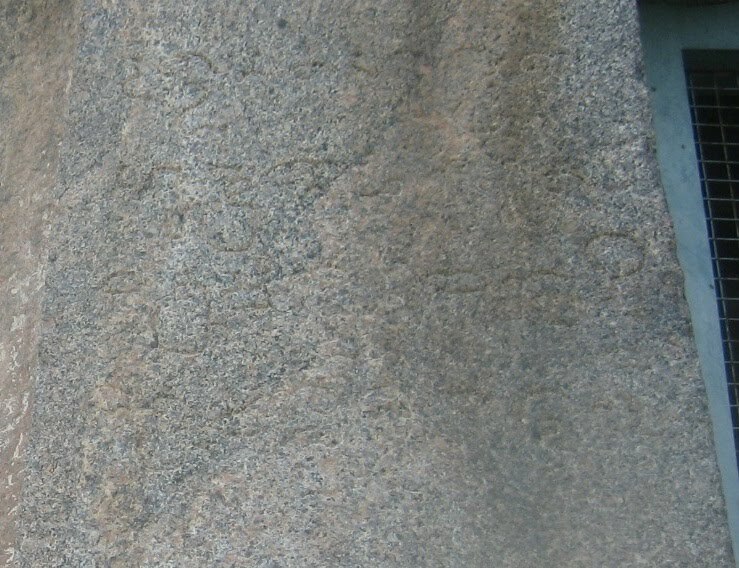 We have few instances where Sanskrit and Tamil inscriptions are engraved at the same time, however no instance where an original inscription is copied quite later after completion of the shrine. He further writes that assignment based upon paleography of inscription is not always correct as we do not many examples of those times to do comparison. He states that in deign and conception this cave seems to be later than Trichy cave of Mahendravarman, though it is devoid of any sculptural panels. In such a case, it could be that the cave was started in Mahendra’s time and might be completed in some of his successor. But if in this case why will he inscribe his inscription before the completion of the shrine, as this is very uncommon. How to Reach – Dalavanur is located about 15 km from Viluppuram and 150 km from Chennai and comes under Viluppuram district. This is a small village hence you might get proper and regular transport, so arrange a taxi from whichever town you plan to visit here. Nearest railway head is Viluppuram and airport is Chennai.